Let me start by saying, I repudiate any racists of any color in any organization in this great country. 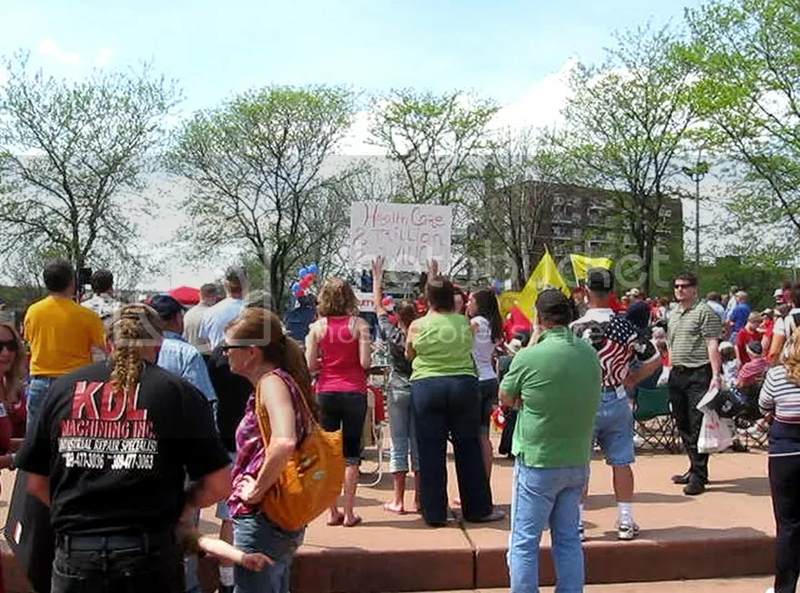 If they come to TEA party rallies, they need to stop. If they come to polling places with weapons, they need to stop. If they give speeches while campaigning for office, they need to stop. Racism is a horrible and disgusting practice. Now that I have done that, and many other TEA party members, and groups have done that over and over again, with the NAACP retract their statement and apologize? Doubt it. See, this wasn’t about pointing out that some elements of the TEA party are racist, it is a clever ploy to label the entire movement in the court of public opinion. They continue to defend their statement by saying they didn’t say the entire TEA party is racist just elements of it, but they know perfectly well that people’s minds don’t work that way. They have successfully called the entire movement racist without actually having to say it. Their site even shows some stupid signs, but we have no idea if these signs were held up at TEA party rallies. They continuously point to the alleged spitting and racial slurs during a Health Care protest in D.C. but they, and others, have failed to provide any proof that it happened. Sorry guys, but if you are going to call someone a racist you better be able to prove it, word of mouth isn’t good enough. Where is the NAACP vote against the New Black Panther Party for their racist elements? Where is the denunciation of President Obama for his “typical white person” stereotype? Where is the NAACP in support of Mr. Gladney who was beaten by SEIU members, doesn’t that mean that SEIU has racist elements because they shouted slurs at him? What about the founder of Black Liberation Theology and his racist remarks, or Rev. Wright and his? Fact of the matter is the NAACP is not interested in equal justice. They are not interested in equal rights. They are not interested in purging racism from the country. They are interested in special justice, special rights, and racism is only racism if directed at a minority. Racism has many definitions. One is the belief that one race is superior, or discriminatory to another. As a member of one, and individual in this country, and a Disgruntled Patriot I hereby vote, unanimously, that the NAACP has racist elements. It promotes ideas, and practices that put one race above another in terms of monetary grants, job placement, and judicial protection. I call on the NAACP to denounce the racist elements in its organization and join with me in the cry for equal justice for all, equal rights for all, and an end to racial bias in our society and government. I call on the NAACP to drop the term ‘colored’ from their name, because of the words connection to oppressive ideals, and change their name to the National Association for the Advancement of All People, or NAAAP (mmm a nap sounds good). 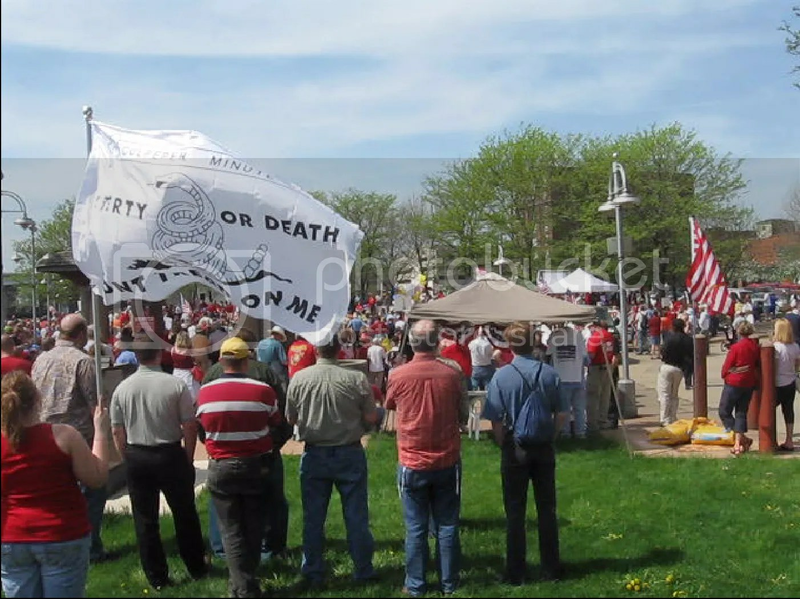 So I went to my first Tea Party rally yesterday, it was a good time. There were hundreds there from all over the state, including one man I talked to from Chicago. Surprisingly the event got a pretty fair shake from the local media, but the national media claims are way off base. First of all, they say that the majority are old white dudes. Let’s take a logical step back for a second. The majority of this country is made up of old white dudes. If you took a slice of any community, you would have mostly old white dudes. When you get together in a group that gathers diverse support chances are you will have mostly old white dudes. So now that logic is out there (the fringe liberal media doesn’t know what that is, you have to help them), let’s blow their other claims out of the water. I saw lots of women, young couples, kids from toddlers to college students. Black, white, asian, hispanic, and jewish communities were represented. I saw young kids with their own signs and not being dragged around by parents. The other media lie to be blown away yesterday was the violent, racist, anti-government sentiment. There was no violence, not even a police presence. The whole event had an air of a family reunion, or community barbecue. I did not see one racist sign, tee shirt, or hear one racist word yesterday. There were no anti-government sentiments at all, as a matter of fact speakers from government were there and weren’t booed. A constitutional studies teacher was there, talking about the importance of limited taxes, the constitutionality of (or lack thereof) taxes, and even said the census was important. One thing he didn’t say (which pisses me off in the commercials) is anything about the census being for ‘getting your community’s fair share. He said the census was important because one of the matches that set of our revolution was ‘no taxation without representation’, and the census makes sure we have proper representation. All in all it was a good time. I learned a lot, and was encouraged by the turnout. 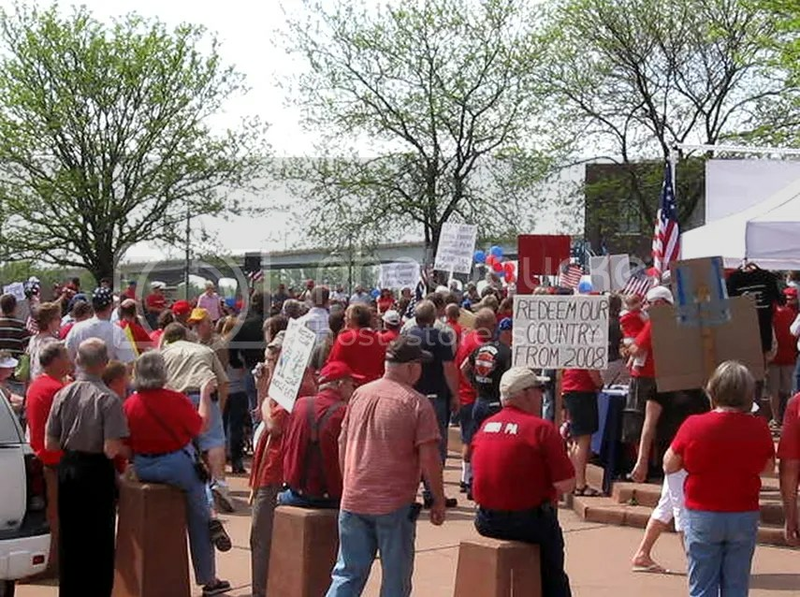 There were no anti-Tea Party protesters, nor idiot infiltrators that I could see. I met some nice people, with good ideas, and great heart. 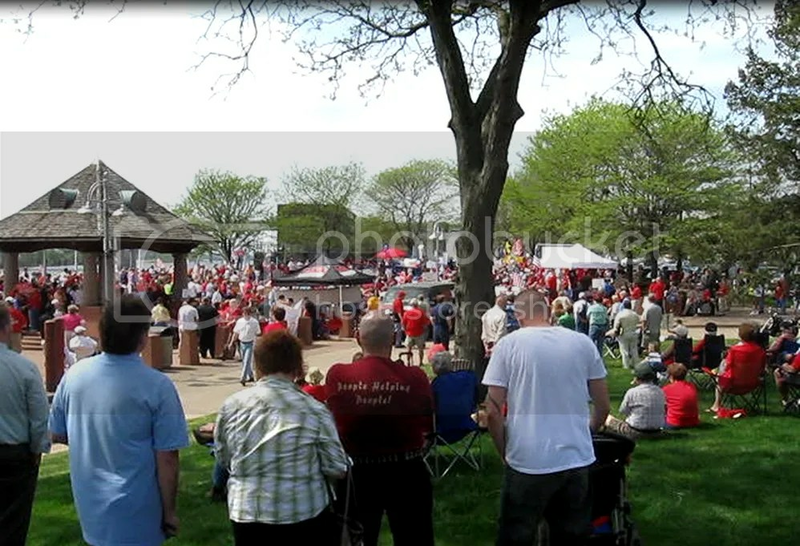 I encourage everyone to visit a rally sometime, even as an observer. You will find them to be the most accepting, good-natured, tolerant people in this country, and contrary to what the fringe media tells you, they want what’s best for everyone, not just the rich. Crash the Tea Party? Does this group help or hurt? “By infiltrating the Tea Party itself! In an effort to propagate their pre-existing propensity for paranoia (who wrote this Dr. Seuss? [not actual quote my own question]) and suspicion…We have already sat quietly in their meetings, and observed their rallies. At first I was mad that a group would intentionally and maliciously defame anyone, whether they agreed with them or not. Then I thought about it, these clowns have given the best PR explanation for the few fringe nuts that DO show up at Tea Part rallies. Some idiot shows up with a racist sign “Hey look, it’s one of those ‘Crash the Tea Party’ idiots.” It can work on so many other levels. The group really is a joke. They claim to use secret code, which they explain on their website and use on their twitter page. The only thing they are keeping secret is where they are meeting, but they are open about which rallies they are going to show up at. I hope to see problems at these locations so I can link right back to their site. They claim to be made up of Republicans, Liberals, and Democrats but if you look at who they follow on Twitter you will notice a plethora of Liberal candy. MSNBC talking heads, left-wing groups, etc. Their forums are a joke, full of hate, bias, and racism, all from their members directed at Tea Party activists that try to engage them in discussion. They claim that the Tea Party is just a bunch of liars, fake grass roots, etc. yet not one of them seems to be able to hold a viable discussion, or make a logical counter-argument. This group won’t last, nor have any effect, because they aren’t grounded in the truth. They are hypocrites and liars, promoting the same. They claim to want what’s good for America but don’t blink about using un-American tactics to achieve their goals. Instead of engaging in civil discussion they would rather use fraud, defamation, lies, etc. They use this tactic because they have no point to discuss. They can’t argue that they support the progressive movement that strives to change our country into something completely different. They can’t argue the current administration’s socialist tendencies, because when given the evidence it is irrefutable. They can’t grasp the concept that the Tea Party movement isn’t about getting Republicans elected, but about getting responsible constitutional representatives in office. The Tea Party will stick to their values, and since they are grounded in truth they will survive, and thrive. Fear looks bad on you liberals, time for a change of outfit. Once you realize that we aren’t here to destroy the Democrat party maybe you will join us. We are here to separate the progressive party from the Republicans AND Democrats and squash the former. We are here to protect everyone’s freedom from government expansion that will bankrupt this country and lead to totalitarianism. Pay attention liberals we are about to show you how American’s really fight for something.